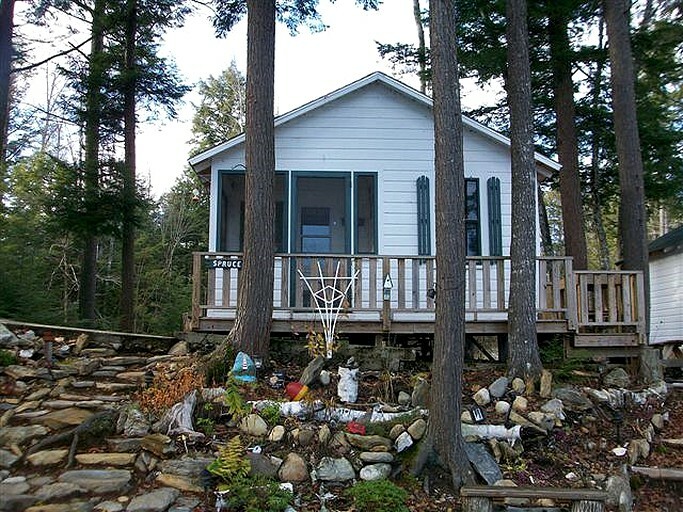 This rustic cottage rental is located on Echo Lake, Maine, and can accommodate five guests. It has two bedrooms and one full bathroom. In the first bedroom, guests will find a king-size bed. The second bedroom provides a bunk bed set consisting of a full-size bed on the bottom and a twin-size bed on the top. In the bathroom, guests will find a toilet, a sink, and a combination bathtub/shower. Linens and towels are provided. The kitchen of the cottage comes with a stove, a refrigerator, a toaster, a coffeemaker, cookware, and cutlery. Outside, guests will find a screened porch. From the cottage, guests will enjoy views of the lake from the ridge on which the cottage sits. The site supplies guests with canoes, kayaks, and rowboats to enjoy on the lake. Boat rentals, spin fishing tackle, and fishing worms are available as well. At the lake, guests will enjoy 600 feet of lake frontage, including a sandy beach area with a gradual descent into the water, making the lake accessible for guests of all ages. Around the lake, guests will find barbecue grills and fire pits, with gas and firewood provided. There is also a swing set on the site and areas where guests can play volleyball, badminton, horseshoes, and croquet. The site also features a lodge that guests will have access to unless the whole lodge is rented out by a group that wishes to keep it private. At the lodge, guests will find a living room, a dining room, a game room, a commercial-grade kitchen, a screened porch, and a wraparound deck. The living room provides guests with seating around a fieldstone fireplace in a cozy, rustic space bound by knotty pine walls. The dining room contains ample wood tables and chairs set around a gas-fired wood stove. In the game room, guests will find a full-size pool table, a foosball table, a multi-game table, and children's toys. The kitchen features commercial appliances that are suitable for large-scale cooking for events. Outside, the wraparound porch has enough bench seating for 60 guests and picnic table seating for another 18. It also features a large grill, a boiler, and an immense pot with a mesh basket for cooking clams and lobsters. There is also a screened porch featuring rocking chairs and a ping pong table. Aluminum boats are available to rent by the day or the week. The boats range from 12 to 14 feet in length, and each one comes with a two-horsepower motor, oars, life jackets, an anchor, and a small can of gas. Tucked away in the woods on the shore of Echo Lake, this glamping site is located in Fayette, Maine, where it provides guests with a sense of seclusion while at the same offering them convenient proximity to the state's capital of Augusta. At the site, guests will enjoy 600 feet of lake frontage and a mixture of sandy and rocky shoreline around the lake, which covers nearly two square miles of surface area. The lake provides abundant opportunities for outdoor recreation and is full of fish and waterfowl. Among the fish that call it home are large and smallmouth bass, brook trout, lake trout, splake, perch, pickerel, and landlocked salmon, while loons are a common sight around the lake. The site is located close to both downhill and cross-country skiing areas, such as the Spruce Mountain Ski Slope and the Bond Brook Trails, both of which are less than half an hour away. At the latter, guests will also find trails for hiking, snowshoeing, and mountain biking. The city of Augusta is only half an hour to the east. Here, guests will find plenty of shops, restaurants, and attractions. Among the attractions are the Maine State Museum, where guests can learn about the history of the state; the Fort Western Museum, which occupies the site of a colonial-era British outpost; the Blaine House, which is a historic mansion that is the Governor of Maine's official residence; and the Viles Arboretum, which is a 224-acre garden and arboretum with five miles of trails. At the lake, guests can go swimming, fishing (including ice fishing in the winter), and boating, with canoes, kayaks, and rowboats supplied by the site and boat rentals available as well. In the woodlands surrounding the lake, guests can go nature walking, bird watching, picnicking, cross-country skiing, snowshoeing, and snowmobiling. Additional opportunities for cross-country skiing and snowshoeing, as well as hiking and mountain biking, can be found at nearby Bond Brook Trails, while guests can go downhill skiing at the Spruce Mountain Ski Slope. The site also has areas where guests can play volleyball, badminton, horseshoes, and croquet. Near the site, there is also an area where guests can hunt on hundreds of acres of land. In nearby Augusta, guests will find many options for dining, shopping, and visiting attractions, such as the Maine State Museum, the Fort Western Museum, the Blaine House, and the Viles Arboretum (see the Location section for more details). This site is pet-friendly; dogs are welcome to stay for an additional per dog, per night fee.